Create a high energy session with skipping and popping! Learn easy to follow skipping stations combined with group popping games. 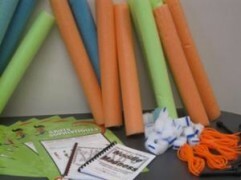 Also included is a classroom set of noodle poppers and two resource manuals: Noodle Madness 2007 and 2008. Noodle poppers are pool noodles cut into small wedges perfect for popping by pinching the wedge between your fingers. A variety of games can be played with this popping technique. The kit also includes an additional list of noodle activities from Ever Active Schools and a sample lesson plan utilizing the above resources developed by the Medicine Hat College Be Fit for Life Centre.